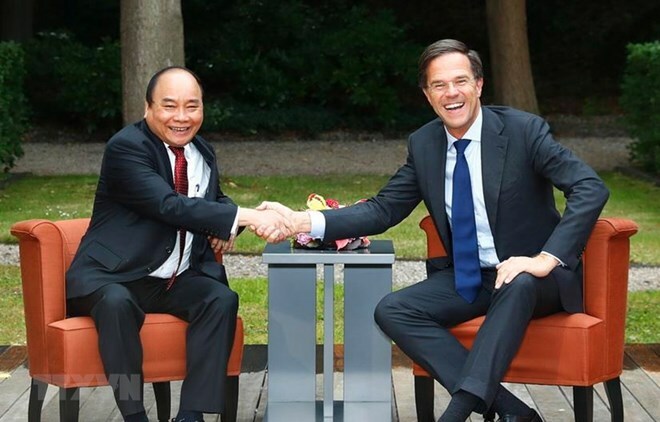 Hanoi (VNA) – Prime Minister of the Netherlands Mark Rutte will pay an official visit to Vietnam on April 9 at the invitation of Prime Minister Nguyen Xuan Phuc. The two countries established diplomatic relations on April 9, 1973. Right after the establishment, the European country started to provide official development assistance and grants to Vietnam, mostly in the field of human activities, education and training, and health care. Currently the Netherlands takes Vietnam as a priority partner. The two sides regularly exchange high-level delegations. Bilateral relations serve as an example of the dynamic and effective ties between Vietnam and a European country. The friendship and cooperation between the two countries have been developing well in every field. The two sides are also actively cooperating with each other at international and regional multilateral organisations and forums, especially in the framework of the United Nations and the Asia-Europe Meeting (ASEM). They often have high-level contacts on the sidelines of major conferences. Regarding the East Sea, the Netherlands maintains a positive stance on the issues relating to security, peace and stability in the region, and holds that the sides concerned should practice self-restraint and solve the disputes by peaceful and cooperative means, with respect to international law, especially the 1982 United Nations Convention on the Law of the Sea. It also praises Vietnam’s rising role in solving the East Sea issue as well as contributions to regional peace and security. Over the past years, trade between Vietnam and the Netherlands has unceasingly developed, with Vietnam enjoying a surplus. Currently the Netherlands is one of Vietnam’s largest export markets in Europe. Two-way trade value last year amounted to 7.84 billion USD, with Vietnam mainly exporting seafood, vegetables, cashew nut, coffee, pepper and rice while importing food, animal feeds and materials, chemicals, pharmaceutical products and plastics. In the recent years, the Netherlands has maintained the position of one of the biggest European investors in Vietnam. In the period from January 1, 1988 to Decmeber 31, 2018, the Netherlands ranked 10th among the 129 countries and territories investing in Vietnam with 318 projects totally valued at over 9.3 billion USD, mainly located in the south. On national defence and security, the two sides mainly join hands in implementing contracts to build ships with the Damen group. A delegation of the Dutch military attaches in Asia visited Vietnam in March 2016 and Vietnam sent trainees to peacekeeping courses in the Netherland the same year. Since 2015, the Dutch side has helped Vietnam implement programmes aimed at improving the capacity to realize the United Nation convention against torture and punishment held in Vietnam. In education, the Netherlands has helped Vietnam in various projects. Many Vietnamese universities and institutes have set up cooperation relations with their Dutch partners. Vietnamese students studying in the Netherlands mainly focus on economics, business management, science and technology. Since 2006, about 170 Vietnamese students go to the Netherlands each year on average. Besides, the two sides also cooperate in the fields of climate change, navigation and aviation, and customs. Many localities in Vietnam are also enjoying close and effective cooperation with those in the Netherlands.